My main research interests are in the areas of mobile and ubiquitous computing, human-computer interaction, artificial intelligence, and geoinformatics. I am particularly interested in spatial interaction (e.g. using proximity regions around devices to trigger certain actions), in accessible interfaces (e.g. that can be used by users with different abilities and backgrounds to solve complex tasks) and in evaluation methods for mobile and ubiquitous systems (e.g. 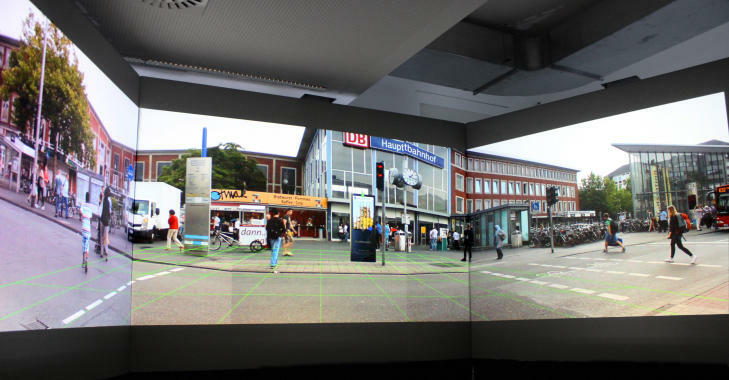 the immersive video environment shown below). If I was to name a theme underlying most of my research, the best match would probably be space and interaction, i.e. I am interested in finding out what role space and spatial concepts play in interaction. Questions that I find interesting in this context include: what impact does the enclosing space have on human-computer interaction? What spatial concepts can be used to simplify the interaction with a computer system? How can we sense and/or infer the spatial configuration of all entities relevant to a series of interactions? I mainly investigate these questions in the context of non-traditional computer systems, e.g. mobile and ubiquitous settings. Since coming to ifgi, I have also become more interested in technological aspects that affect everyday life or will affect it in the future. In particular, I have started to work on societal issues such as how to make smart cities more liveable and open, how to ensure that location privacy is managed in a way that regular users can understand, and how to realise open reproducible science to make scientific work more effective and accessible. Most of my research is focussed around actual users and has a strong practical component. In order to build and test prototypes, and also to run user studies much of the research work takes place at our lab - the Situated Computing Lab (sitcom lab). We also carry out field studies as well as observational studies. PhD & MSc students If you are looking for a topic for an MSc thesis, have a look at my teaching page or at list of open topics (if you're a local student). Prospective PhD students might want to have a look at Graduate School of Geoinformatics for information about how our PhD programme is run. In terms of topics, please have a look at what is described here and on the lab page.